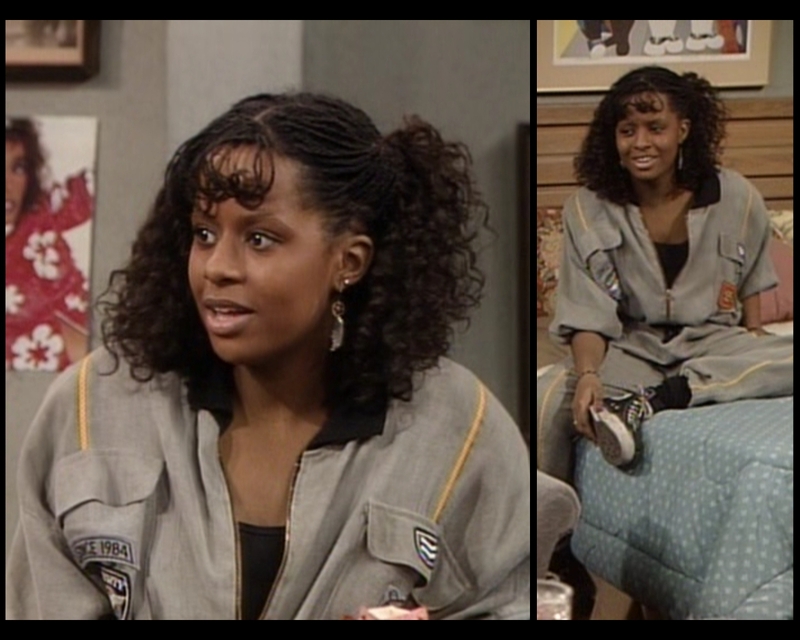 Theo flips out when one of his friends asks Vanessa on a date because the exaggerated stories in the locker room now apply to his sister. Meanwhile, Cliff tries fruitlessly to figure out how Rudy performed a rather impressive magic trick. 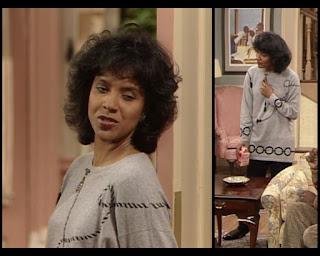 This is also the episode that calls Clair's age into question: while it was previously stated that Cliff chose Hillman College because he was following his soon-to-be wife, Vanessa claims this week that her mother is four years younger than her father. Maybe she skipped two grades and he was held back twice? I'm going to need to see some long-form birth certificates. 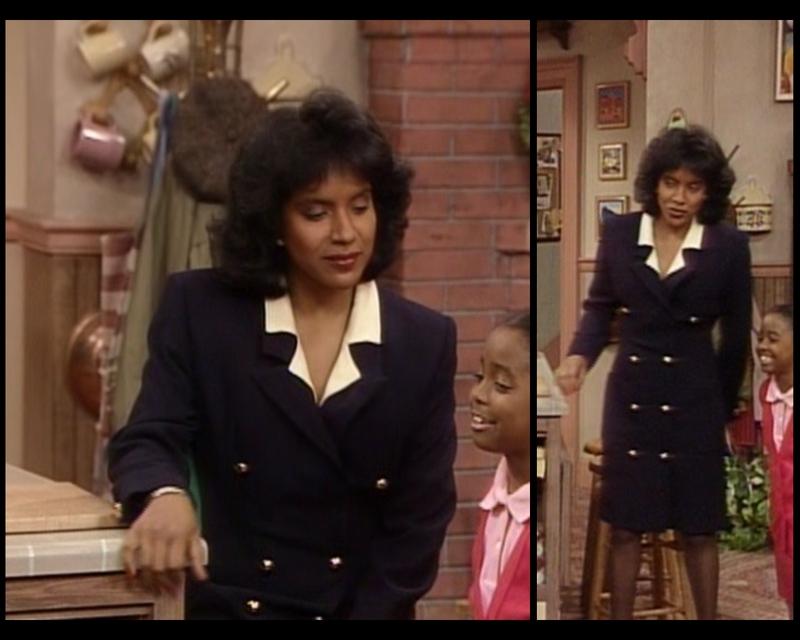 But enough joking: we've got a bevy of guest stars plus two outfits per Huxtable, so it's time to get moving. I was genuinely surprised at how long they spent dispensing lurid innuendos. Theo has several friends this episode, though it still feels weird that none of them is Walter "Cockroach" Bradley. This crew, often seen in gym clothes, strives desperately to fill the gap. He comes back in later episodes. Hopefully in something worthwhile. 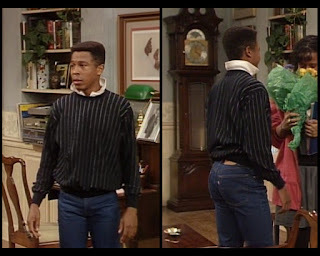 This is Denny, played by Troy Winbush, who you might recently have seen depicting Morris Elcott in the new series Scandal. 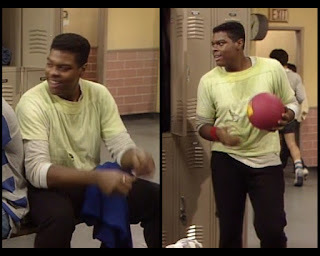 He is not referred to by name in this episode and never wears actual clothing (gym clothes don't count on this blog). Sorry, Troy. Though the IMDb credits this man as Gerald, I'm pretty sure someone calls him Gordon during the episode. Regardless, he's played by Brian Grant, who has a rather scant and sporadic work history. You can't deny that he looks great, though. 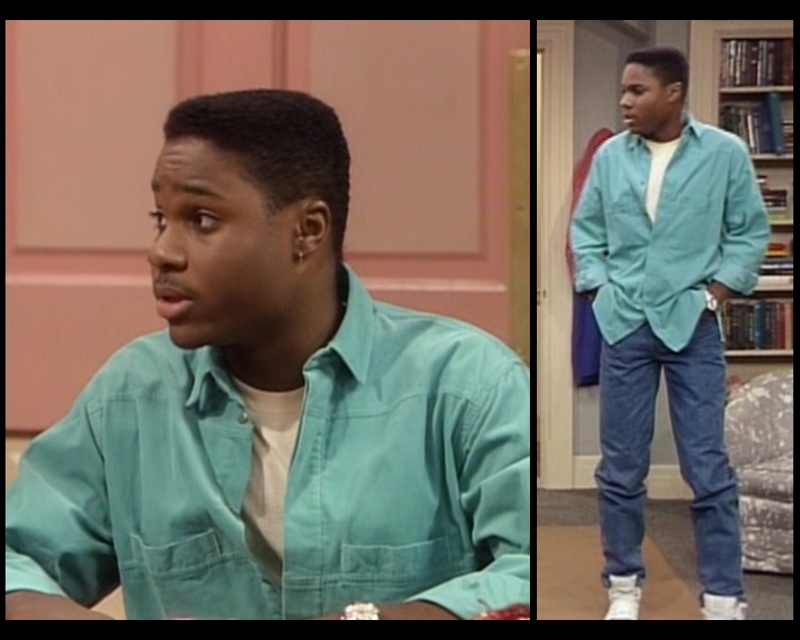 If I were him, I'd forgo the long-sleeved polo and just rock the white tee and jeans. When you have pecs like that, you shouldn't be hiding them under multiple layers, you should be showing them off in the tightest clothing you own. His performance is unbearably annoying. 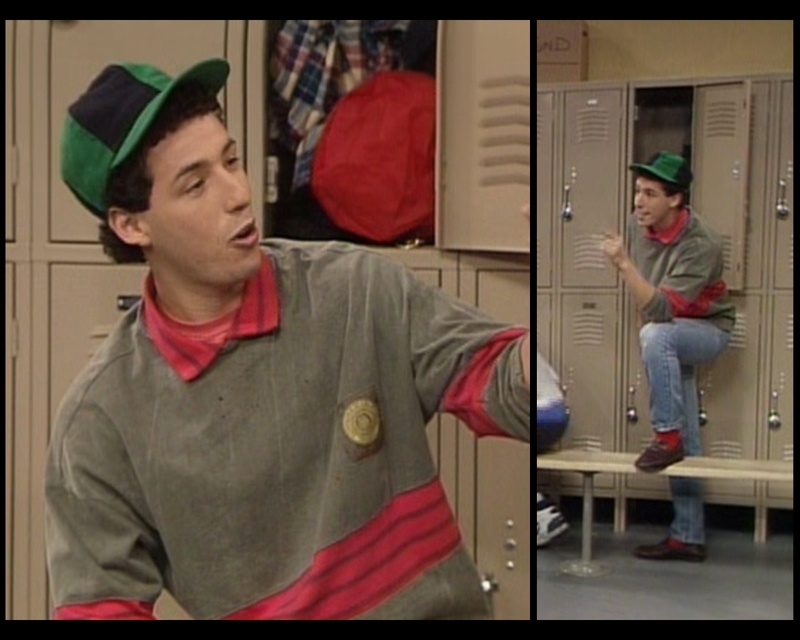 Adam Sandler returns as Smitty, who is obviously intended to be a class clown type. I question this shirt. If he were wearing an olive sweater with a rich, watermelon-colored Oxford underneath it, I'd almost be OK with it. But the fact that the striped collar is built in (and repeated as its own stripe-within-a-stripe through the midsection) is too much. That design element might work if the shades coordinated better, but since they don't, he comes off as pushing too hard. The matching socks and clashing cap aren't helping him any. He brought flowers. Give him a break. Last up is Lyle Thompson, the dude with his eye on Vanessa. Dennis Singletary, the man behind the role, has done a lot of one-off work on various TV series over the years. His look here is on the right track, but lacking in a couple key areas. The jeans are perfect (look at the fit across the back! ), and the concept of a thin, vertical stripe on a monochrome top is great, but the sweater, or maybe sweatshirt, is too large and that popped collar is unacceptable. If he expects to succeed on a date with a Huxtable girl, he needs to pull those details together. 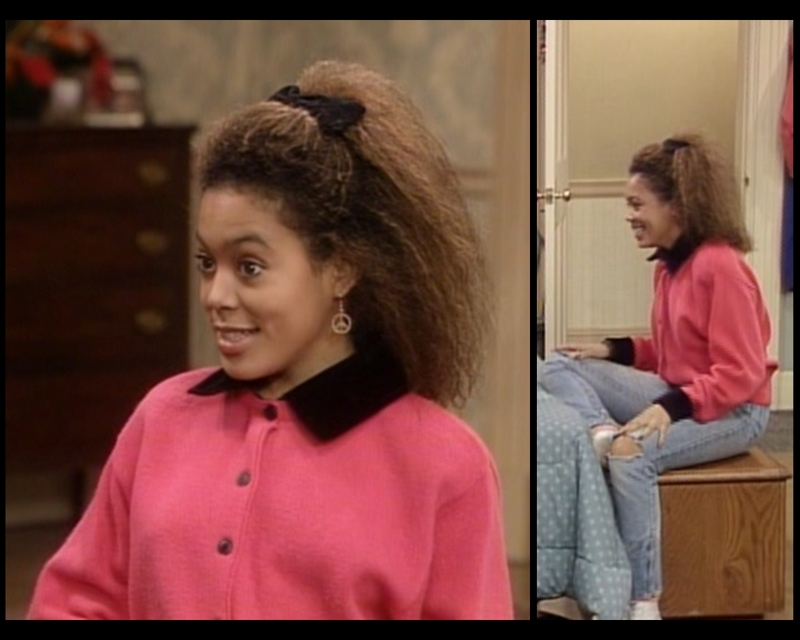 Janet Meiser is back; Vanessa gets a recurring friend to make up for Theo's long-lost partner in crime. Individually, the pieces of her outfit more or less work, but they don't cohere in the slightest. The peace sign earrings have a '60s appeal, while the bow in her hair is traditionally girlish. The businesslike blouse communicates a technicolor Sarah Palin persona, while the light, tight, ripped jeans are standard '80s teen chic. Each of these garments could be the basis for a solid presentation, but they don't combine well. Stop trying to make clown realness happen. 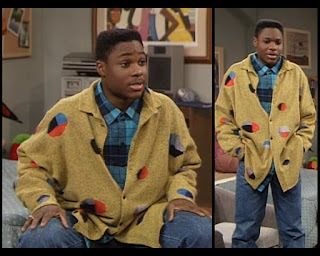 This getup for Rudy is nonsensical. There's something rather chic about that long plaid top; on a full-grown woman, I could see it being a weird but not inelegant dress. Unfortunately, it's accompanied here by felt circus leggings and chunky boots. I guess it's arbitrary and unfair to complain about a childish outfit on an actual child, but let's face it: this blog is arbitrary and unfair. She's representing Luxembourg in the Junior UN. She gets closer with her second outfit, serving pink-on-pink business casual on top with a looseness that reads as playful without crossing the line into disheveled. The bunchy socks and white sneakers ruin it, though. You're not on a tennis court; you're not 80. Fix it. She's fixing the air conditioning at the Junior UN. Vanessa's first look is a NASCAR pit crew coverall that reminds me of Denise's episode #2.15 flight suit. The tailoring here is a little baggier, but I'm not against it. She keeps the palette fairly tame, going for mostly grays and blacks with only the barest hint of yellow to spruce things up. 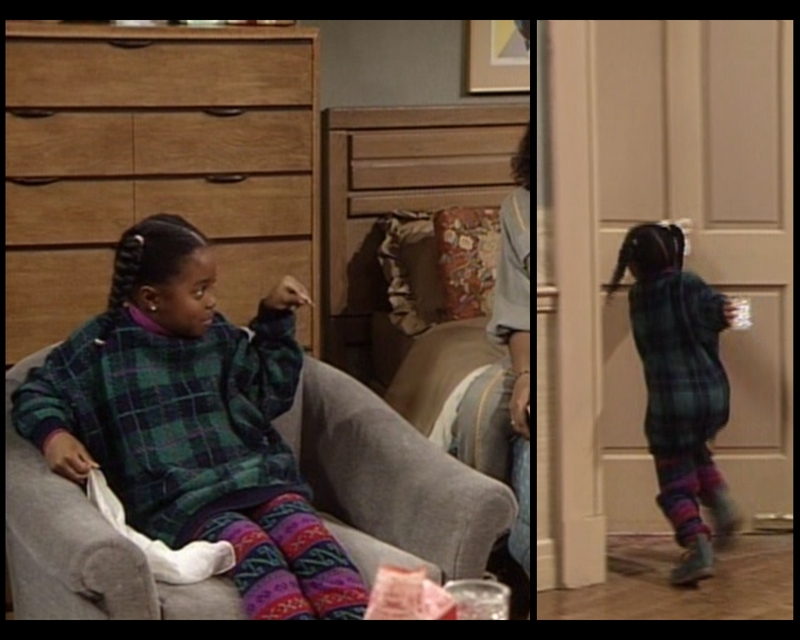 Overall, there's a tomboyish, relaxed quality to this choice that pleases me. 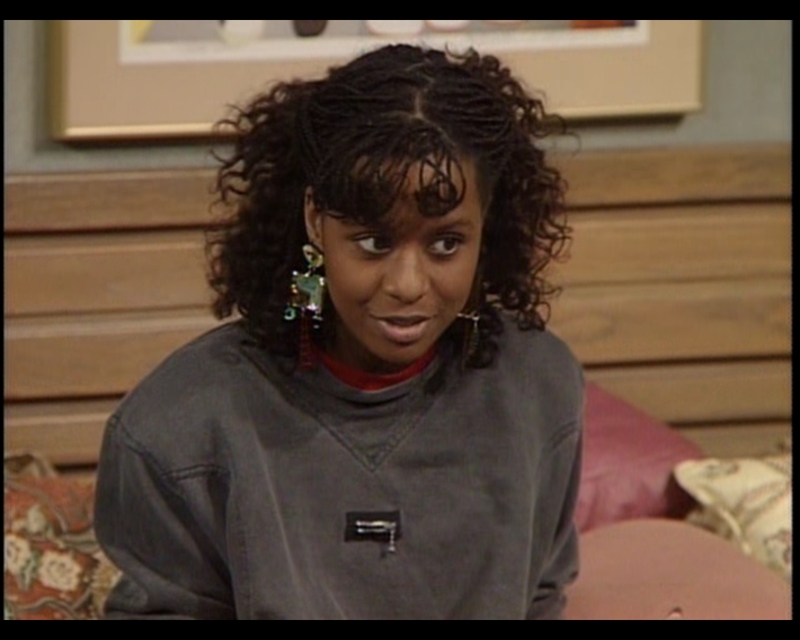 This is also a good time to note that Vanessa is seldom without earrings, usually something dangly. Generally, I'm a proponent of having a signature style. What is that pocket for? 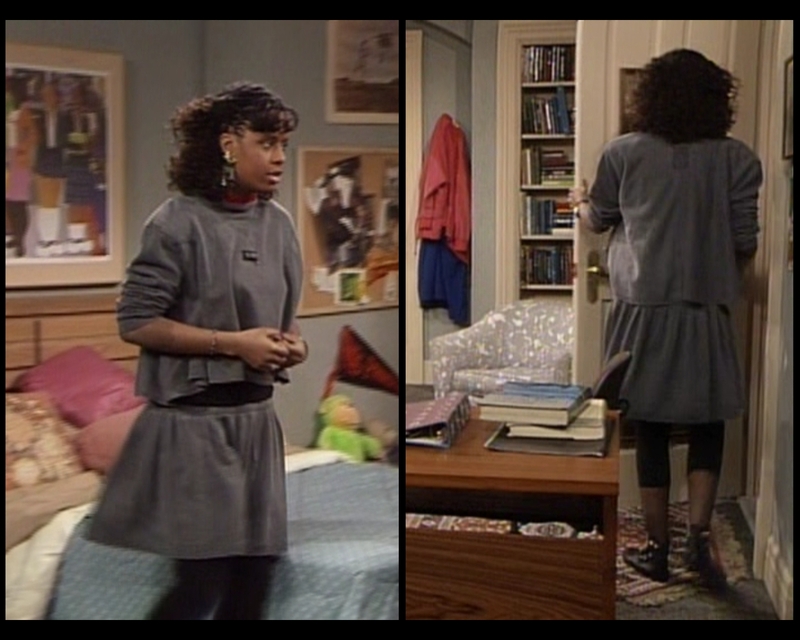 She lays the gray on pretty heavy this week, making it the main focus of her second outfit as well. And see what I mean about the earrings? Really going for it. The seams and tiny zipper seem like distracting details rather than thoughtful embellishments, however. Plus, as the wide shot will soon illustrate, the sizing on this is nuts. That view from behind? Total ogress, am I right? Don't crop a top in the front if you're not going to crop it in the back. Otherwise, this nonsense happens. Also, the looseness of a crop top doesn't translate well when applied to long, heavy sleeves, because then you have to bunch them up and you get sausage arms. Just wear a nice shirt that complements your shape and call it a day. Not every innovation is an improvement. Am I having a stroke or is this kind of OK? You know what? I'm happy to see Theo returning to a place where he's taking risks. In fact, I'm so pleased with the leap into foreign territory that I'm going to choose to enjoy his creation. The foundation of jeans and an electric blue plaid would be great on its own. While I usually wouldn't have a great deal of praise for the mustard smock covered in pie charts, I feel like its wildness is maybe its own justification. I'll let him have it. 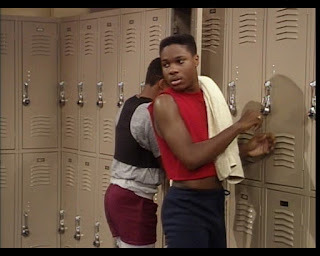 I don't typically review athletic gear, but it has to be noted that Theo wears a belly shirt to gym class. 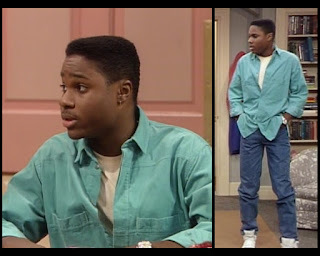 Theo's second real outfit is a rehash of his episode #4.8 shirt, albeit this time unbottoned with a cream tee beneath it and blue jeans swapped for black pants. A solid if unremarkable choice. Let me start by saying that a different close-up of Clair would have offered a better view of the details on her shirt, but I wasn't about to pass up that facial expression. You're welcome. Anyhow, this is a frisky take on at-home casual. Sure, it's a lanky tee, but the low hem and twisty details give it some charm. Also, it has a literal charm dangling there at the collar, and this is a woman who should never be denied a little sparkle. It's a hair dowdy, but she pulls it off. She's representing God at the Junior UN. These outfits kind of make me wonder where Clair was taking Rudy. I love that the costumer decided for herself, without any real indication from the script, that Clair and Rudy had somewhere fancy to be. This dress isn't anything magnificent and is maybe even too prim for Ms. Huxtable. She doesn't need to be styled this matronly. The off-white collar peeking out to overlay the wider lapel is a helpful touch, but the heavy fabric is adding too much heft. It's not that she looks bad: it's that I know she could look so much better. 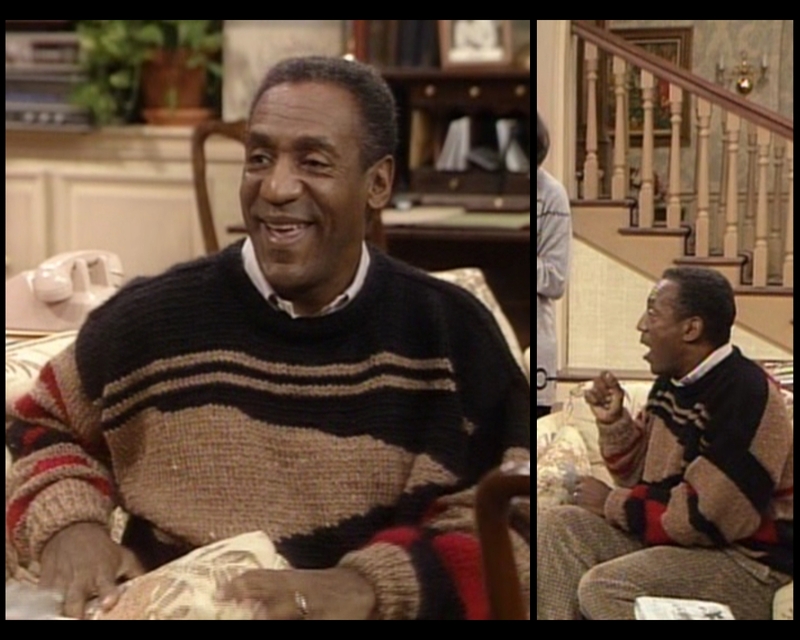 While I usually rave about Cliff's crazy sweaters, this one has left me cold. Beyond the bigness problem that plagued this decade, he's fallen into a color scheme that does nothing to catch the eye. Similarly, these horizontal-ish bands aren't daring enough to garner notice. His patterned pants only add to the trouble by failing to match the tan knit in the way he intended. I have to call this one a total loss. He's never once pulled something out of those cargo pockets. A waste. 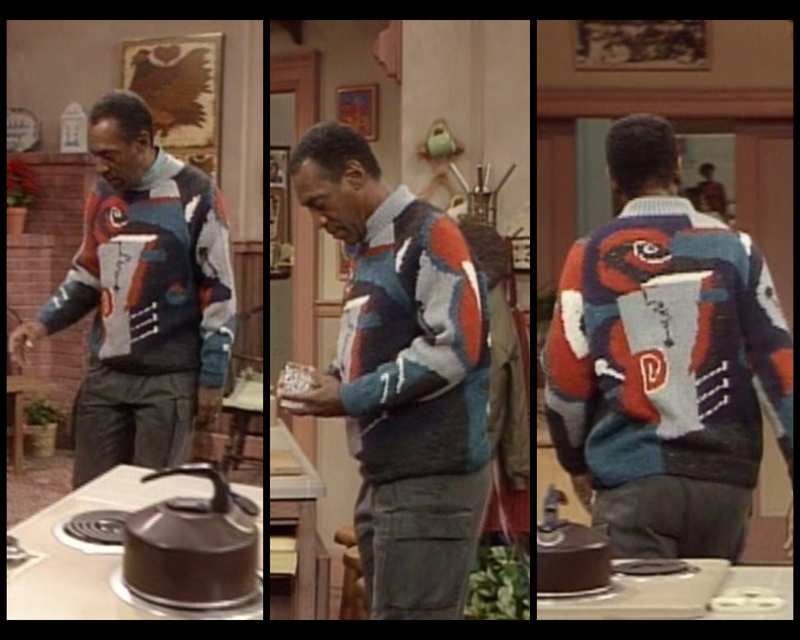 My favorite genre of Cosby sweater is the art sweater. You know the kind: the ones that wouldn't look out of place painted onto a canvas and hung in a frame. This is one of those, with an abstract design and unexpected palette combining to form a piece that almost looks like it isn't supposed to be worn on the body. And what is that gray thing that forms the central image on both the front and back? The devil's coffee grinder? A futuristic toilet? I'm sure it's not supposed to represent anything in particular, but my mind craves meaning! Side note: that collar isn't an undershirt, but rather a built-in mock turtleneck. I'm weirdly enjoying it. Also, I'll give him bonus points for well-selected pants. I kind of want Claire's lanky tee... and you're not crazy, Theo's plaid+pie outfit is fun. I'd totes wear it, though that's not saying much.